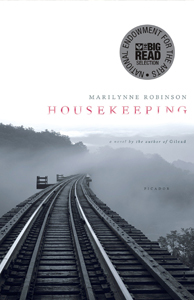 A friend turned up at a coffee meeting with a book she said I had to read – Housekeeping by Marilynne Robinson. The book was first published in 1981. According to my friend, the book had an enormous impact on her life. 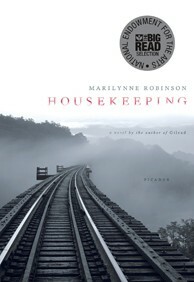 Housekeeping is a shimmery, incandescent sort of novel – you can’t quite put your finger on it. The story stays ahead of you, slightly out of reach. As Doris Lessing said “This is not a novel to be hurried through, for every sentence is a delight.” The language used and the choice of words are beautiful and mellifluous and lead me to believe that the author is also a poet (although Wikipedia doesn’t say so). Foster, and when they fled, of her daughter, Mrs Sylvia Fisher.” Ruth narrates the story in her matter-of- fact way, never expecting anything from anyone, always expecting to be abandoned. The pathos of the story is intermittently lifted by the humour in Ruth’s voice. There is a sense of madness in the characters that started with Ruth’s grandfather, moved through her mother, Helen, and culminated in her aunt Sylvie. Sylvie is a ‘transient’ and she is the girls’ final guardian after they are orphaned through their mother’s suicide. Lucille rails against Sylvie’s oddball ways and leaves the house to live with one of her school teachers, but Ruth stays on. One has a sense that she feels responsible for Sylvie, as much as she realises her limitations as a child and knows that she cannot actually look after or protect her strange aunt. When it looks like the Sherriff is going to take Ruth away, Sylvie and Ruth set fire to the house and leave town via the railroad bridge. The townspeople believe them to have drowned in the lake and so they escape into an anonymous life on the road – the life of a transient. A delightful book that deserves a periodic re-read to remind one of the joy of reading beautiful prose.